Established in July 2007 by the merger of the Southeastern Association of Colleges and Employers (SACE) and the Southwest Association of College and Employers (SWACE), SoACE brings 110 years of collective SACE and SWACE history, tradition and professional excellence together into a new association well positioned to thrive and provide leadership and vision to college career services and recruiting well into the 21st century. SoACE is an association of colleges and employers from across the 15 southern “sunbelt” states, including some of our nation’s most vibrant economies, fastest growing cities, and most diverse populations. 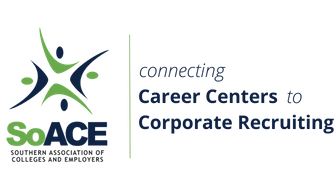 Our membership includes more than 800 college career services professionals and corporate human resources/recruiting professionals who hire college graduates. SoACE brings career services professionals and corporate human resources/recruiting professionals together to network professionally, exchange information about best practices, and learn how we can most effectively facilitate the post-graduation success and employment of the college students in our region. The Southern Association of Colleges and Employers has evolved greatly over the past ten years since its inception in 2007. Beginning in 2011, Knowledge Groups (KG’s) began to provide SoACE with more opportunities for year-round professional development, with eight KG’s including Administration, Alumni Career Services, Career Advising/Counseling, Employer, Employer Relations, Experiential Education, Two-Year Colleges, and Technology. In 2016, the Alumni Career Services KG was retired and a new KG, Assessment and Data Analytics, was created to maintain relevance with current trends. Professional development opportunities such as, webinars, research opportunities, industry best practices and employer summits have helped provide SoACE with year-round opportunities. In 2013, the SoACE membership voted to approve an update to the membership definition allowing for greater inclusivity. Previously, our membership primarily consisted of college career services and employers. However, due to the evolvement of the profession, more and more career professionals served in offices other than career services. The membership definition was limiting, keeping potential members from joining. A task force was appointed to recommend changes to the membership definition making it more inclusive. The vote passed unanimously. In addition to expanded membership by-laws, SoACE was mindful of the evolution of thought and practice to how we approached our work and created an Imaginative Spirit Award in 2013 to promote and recognize innovative thinking in our membership and the field. With a commitment to diversity and inclusion at the forefront of the association, 2013 sought out to promote and recognize both individuals and groups who also placed an emphasis on D&I. During this time, the Champion of Diversity, awarded to an individual, and the Mosaic award, presented to an organization were created. With the changes in membership allowing for more inclusivity, 2014 brought about the possibility of group membership. Another task force was appointment to look into the feasibility of group membership for the association. This task force spent a number of hours collecting data, looking at possible budget scenarios, strengths and weaknesses of group membership. After deliberately analyzing all the possibilities, the board put forth a motion to the membership to vote for a group membership option. The vote passed unanimously allowing for groups of 6 or more at $600 while individual membership rates remained at $110. With group membership, SoACE membership increased to over 1,000. In 2015, the SoACE membership voted to approve an increase in membership fees. Regular, Affiliate and Individual membership fees increased from $110 to $130 and group membership fees increased from $600 to $650. Student membership stayed the same at $55. Excitement continues to build for the 2017, 10-year anniversary of SoACE, which will be held in San Antonio, home of the first SoACE conference. In 2003, the leadership of the six regional associations of colleges and employers convened a strategic planning team to look at our profession and make recommendations regarding association structure, management, programs and activities that would most benefit our profession and promote the ongoing viability and relevance of the regional associations. The result of these meetings was a report entitled “Building Our New Direction” (The BOND Report). The BOND Report was presented to the SACE and SWACE Boards and leadership teams and used in their respective strategic planning. A major recommendation in the 2003 BOND Report was the consolidation of the six regional associations down to four regional association of similar size, scope and focus, including the merger of SACE and SWACE to form a single association. The SACE and SWACE Boards decided to explore this recommendation further, and in 2004-05 they convened a joint task force to further study the BOND Report and its recommendations specifically as they related to a possible merger of the two associations. This task force studied the BOND Report recommendations regarding the proposed merger including reviewing the advantages/disadvantages and costs/benefits of a merger. It was asked to identify similarities and differences between SACE and SWACE and the strengths and weaknesses of both organizations, along with any issues that would make a merger unfeasible or indicate that a merger would not be in the best interests of the associations and their members. Upon completing their study and analysis, the 2004-05 Task Force recommended proceeding with the merger and conducting thorough due diligence. The SACE and SWACE Boards accepted the recommendations of the 2004-05 Task Force, and the general membership of both associations further endorsed the concept, with 89% of the collective membership voting in favor of proceeding with a potential merger. As a result, the 2005-06 Merger Implementation Task Force was convened and charged with conducting thorough “due diligence” and developing an draft merger implementation plan and timeline. The 2005-06 Task Force’s report and recommendations were presented to a joint meeting of the SACE and SWACE Boards in June 2006, at which time both Boards voted unanimously to move forward with the merger of SACE and SWACE. In fall 2006, the formal plan for merger was placed before the general memberships of both organizations, and 94% of SACE and SWACE members voted for the plan, legally and officially clearing the path for a July 1, 2007 merger. Throughout the merger process, SACE, SWACE and SoACE leadership was assisted and supported by the association management firm Baldwin-Hunt Associates. Baldwin-Hunt principals Donna Baldwin-Hunt and Skip Hunt provided association management services to both SACE and SWACE prior to the merger, supported the Merger Task Force team throughout the merger process, and were retained by SoACE to provide association management services for the new association. Legal counsel related to the merger was provided by attorney James Seely with Association Legal Services in San Francisco. The 2007 merger of SACE and SWACE to form SoACE was the final step in the consolidation of seven regional associations down to four: SoACE, the Midwest Association of Colleges and Employers (Midwest ACE); the Eastern Association of Colleges and Employers (EACE); and the Mountain Pacific Association of Colleges and Employers (MPACE). Leaders of these four regional ACEs meet once a year to discuss and plan collaborative efforts and exchange best practices and network professionally across regions. SoACE convened its first annual conference in San Antonio in November 2007 under the theme “Synergy in San Antonio”. This first opportunity to bring the former members of SACE and SWACE together as members of the Southern Association of College and Employers was attended by 560 members (approximately 70% of the then-current membership). 2012 Shelly Underwood, Tesoro Companies, Inc.